Need a junk removal service to complete a house cleanout or an estate cleanout in Philadelphia, Pa? Philly Junk removal service is a locally family owned junk removal service who has been serving all of Philadelphia, Pa. for almost ten years. The process for a house or estate cleanout in Philadelphia, Pa. is simple. 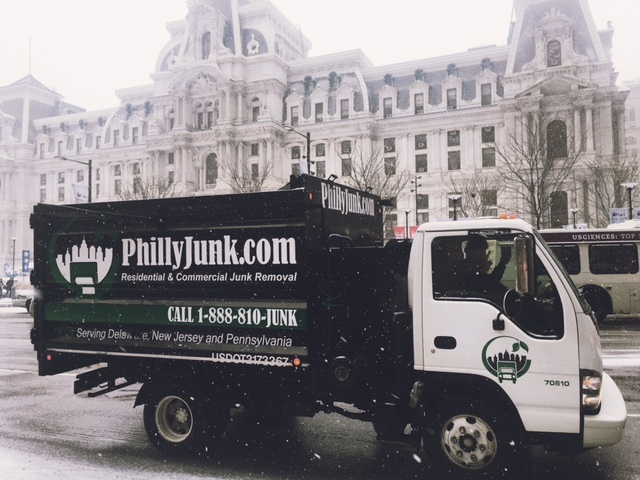 Just call Philadelphia Junk Removal known as PhillyJunk® or Philly Junk and provide a day and time you want one of our trucks and uniformed crew there. Need more than one truck then we will bring as many as required. Need to figure out how much stuff you have or how much it will cost then we send out someone to help determine an estimate for you. We will walk you thru the process step by step to make sure every tying you need removed gets removed in a timely manor. There is no preparation work needed before we arrive. It helps if everything you want to keep is marked or already removed from the property. If you need a house cleanout or an estate cleanout anywhere in Philadelphia, Pa. call the locally family owned business of PhillyJunk®. We operate anywhere in Philadelphia and in every surrounding county such as Bucks, Montgomery, Chester, & Delaware county, Pa. All of our employees wear uniforms, pass background checks and have clean driving records. Once the material is loaded we donate what we can and the rest is dropped off at recycling centers. Call PhillyJunk if you need a basement, garage or apartment cleanout. If you are moving your office, closing our retail store or just need some trash material removed call PhillyJunk and set up the day and time you want us to arrive.